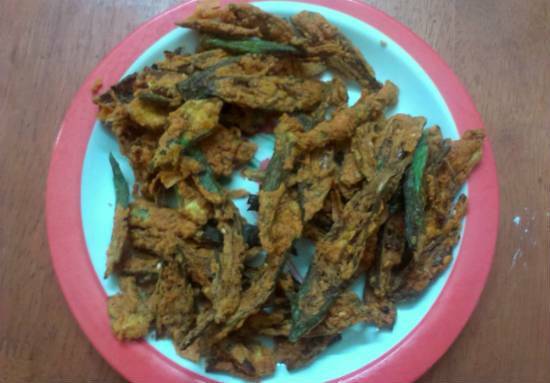 Vendakkai Pakoda (or Okra Pakora/Bhindi Pakora) is a tasty and easy to make evening teatime snack. They make a tasty snack for kids and can also be served as an appetizer to any meal. 1. Wash and pat the okras. 2. Cut the tops and tails off. 3. Slice the lengthwise into 2 pieces and keep aside. 4. Remove and discard the seeds if preferred. 5. Add salt, turmeric powder and tamarind extract to a pan. 6. Place it over medium flame. 7. Add the sliced okras and simmer for a minute. 8. Drain well and keep aside. 9. Mix the corn flour, rice flour, peanuts, salt, garam masala powder and maida in a bowl. 10. Add enough water and mix well to a thick batter. 12. Dip the okras in the batter, shake off any excess and add to the hot oil. 13. Deep fry until light golden brown and remove. 15. Serve hot with sauce or chutney. Feel free to comment or share your thoughts on this Vendakkai Pakoda (Bhindi Pakora) Recipe from Awesome Cuisine.